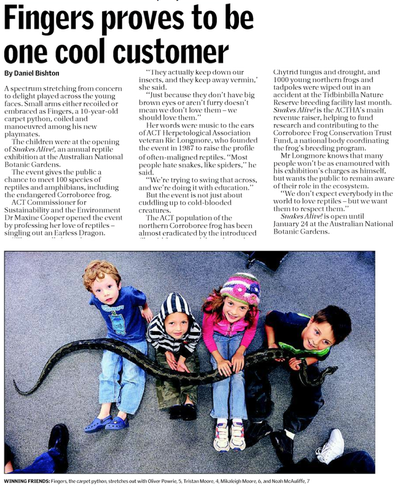 Each year the ACT Herpetological Association (ACTHA) in partnership with the Australian National Botanic Gardens (ANBG) put on a week long exhibition in January showcasing a variety of Australian reptiles and amphibians, many of which are threatened, endangered and very rarely seen in the wild or captivity. 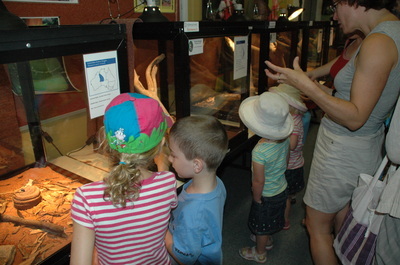 Members of the public receive an exceptional educational experience with the opportunity to learn about reptiles and amphibians in a hands-on way from dedicated ACT Herpetological Association volunteers. 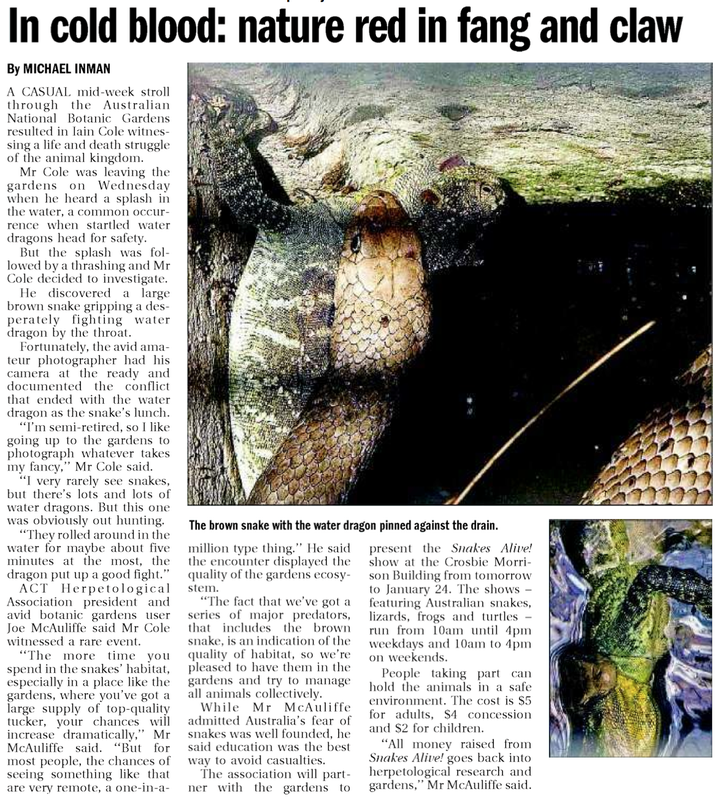 Snakes Alive! is open from 10am - 4pm daily from with feeding times not to be missed at 11am, 1pm and 2pm daily. The Crosbie Morrion Building at the ANBG where the display is held is air conditioned, perfect for escaping those hot summer days! 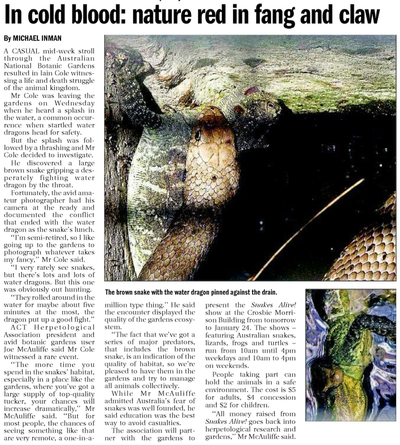 Funds raised through Snakes Alive! 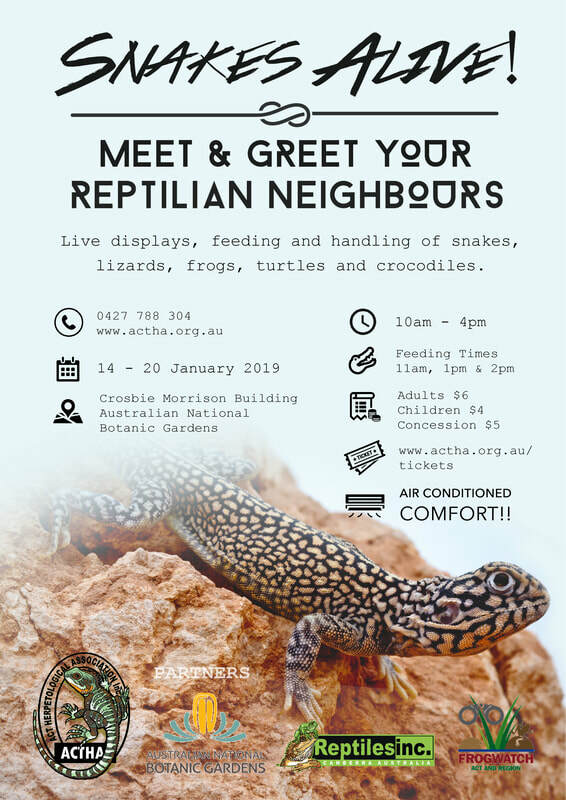 give ACTHA the opportunity to make donations to support regional conservation issues such as the Northern and Southern Corroboree Frog breeding programs and projects aimed at furthering reptile and amphibian protection and recovery, education, training, and research projects. Species local to the ACT and Southern Tablelands region are displayed, such as the highly endangered Northern Corroboree Frog (Pseudophryne corroboree) and threatened species such as the Grassland Earless Dragon (Tympanocryptis pinguicolla) and Striped Legless Lizard (Delma impar).